Experience the sights and sounds of bustling San Jose, Costa Rica contrasted with the surreal serenity of the Pacuare River, the adventures of Arenal and the sprawling beaches of Manuel Antonio National Park. 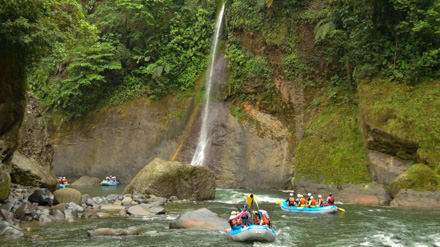 Along the Pacuare River, you'll escape from civilization, but savor luxurious comforts in a candle-lit jungle bungalow. You'll spend 2 nights at the lodge, experience an exhilarating canopy tour and explore the unbelievable rainforest surroundings. Your Costa Rica vacation itinerary continues as you raft the Pacuare River through exciting whitewater and cascading waterfalls. Next you'll find yourself soaking in the hot springs of Arenal's famous Tabacon Thermal Resort and exploring the depths of the Costa Rican jungle on hanging bridges. 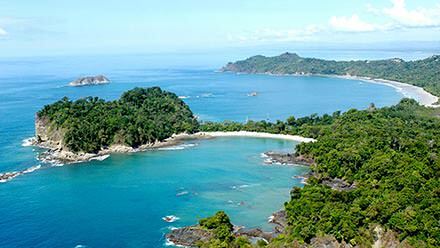 Finally, your vacation itinerary ends as you explore the spectacular Manuel Antonio National Park and relax on some of the world's best beaches. Arrive at the the San Jose, Costa Rica (SJO) International Airport. A representative will be awaiting your arrival and will provide a private ground transfer to your San Jose hotel. Enjoy the evening to explore the bustling city of San Jose on your own. Overnight in Double Superior room at Hotel Grano de Oro or similar room or property. You’ll be picked up at your hotel lobby and driven in a comfortable microbus (approximately 2½ hours) to our starting point on the Pacuare River. During your drive, you'll see the country’s former capital of Cartago and massive Irazú Volcano, with a stop along the way for a typical Costa Rican breakfast of eggs, gallo pinto, fresh fruit and coffee. After a quick lesson in white water rafting, you’ll begin an exciting 1-1½ hour trip down the Pacuare River (class II-III rapids). 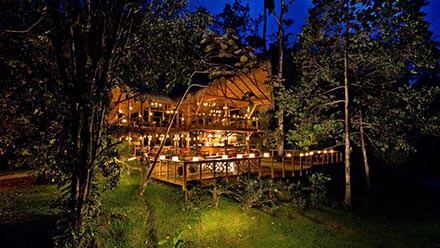 Midway down the river, you'll pull into the award-winning Pacuare Lodge, Costa Rica’s premier eco-lodge. After a delicious lunch, you can take part in a hike to a 30-foot waterfall in the rainforest. In the late afternoon, you may want to join fellow travelers in our main lodge for a cocktail or other beverage before enjoying a delicious candlelight dinner. After dinner, you'll retire to your bungalow. Modern wooden bungalows with thatched palm roofs have been carefully designed in an indigenous style to blend into the surrounding forest. Each hides beneath giant trees that have stood guard over this forest for eons, and comes complete with private bathroom and shower, comfortable bed, and fresh linens. Wake to songs of birds and the soothing sound of the river. Head over to the main lodge for a delicious breakfast of home-made bread, tropical fruits, yogurt, eggs, pancakes, cereal and juice and coffee. The two-story Pacuare Lodge has comfortable, rustic dining facilities on the first floor, and sitting areas with sofas and hammocks in an open-air lounge on the second floor. 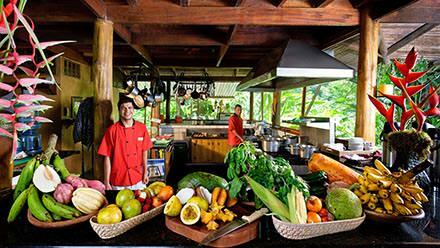 Your package now includes 8 adventures during your stay at the Pacuare Lodge. 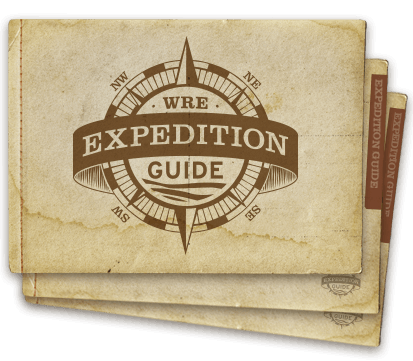 These are selected in the Concierge Office upon your arrival (see list in the Costa Rica Expedition Guide). We especially recommend the Adventure Canopy Tour – where visitors glide amid a tropical rainforest canopy. A resident naturalist guide will provide you with unique insights into the plant and animal world. After your canopy tour, or in between your other adventures at the lodge, you'll have time to relax in the jungle surroundings and enjoy a freshly-prepared lunch and another special dinner overlooking the Pacuare River. 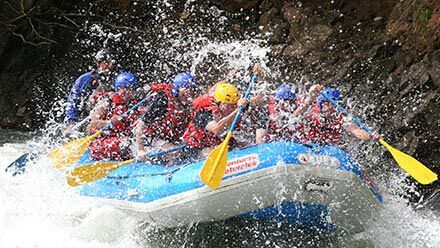 After breakfast, you’ll leave the lodge and begin a fun-filled day of white water rafting excitement (approximately 3½ hours in class III-IV rapids) on one of the world’s most beautiful rivers. You’ll paddle past pristine rainforest, waterfalls, and an array of birdlife that includes toucans, herons, kingfishers and cormorants. A delicious picnic lunch is served along the river en route. At our river take-out, you’ll have a chance to change into dry clothes at our private facilities before boarding the minibus for the trip to Arenal. Savor a buffet dinner on the open air Terrace at the Tabacón Resort. Overnight in Tabacón Grand Spa Thermal Resort in Double Superior room or similar room or property (breakfast, lunch and buffet dinner included). You will experience this natural paradise via hanging bridges as you walk along a three kilometer trail that includes 15 bridges that allow you to experience the forest from the ground (like a Jaguar) from the middle (like a Monkey) and from the treetops (like an Eagle). Transportation to and from your hotel is included. Enjoy a free afternoon to refresh your body at Tabacon Hot Springs. Here you will find a seemingly endless maze of trails and bridges connecting a hidden oasis of steaming pools and waterfalls. You may find that you never want to leave! 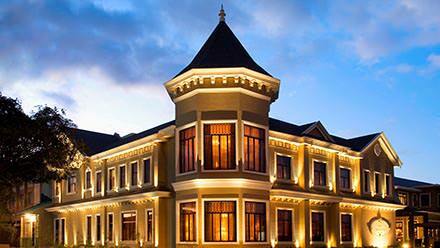 Overnight at Tabacón Grand Spa Thermal Resort in a double superior room or similar room or property (breakfast included). A representative will pick you up at your hotel early for a 5-hour trip along scenic mountain roads to Manuel Antonio. 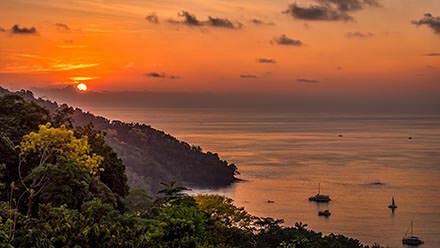 Spread over a forested ridge overlooking the Pacific with unforgettable coastal views, the area’s postcard-perfect beaches include Playa Manuel Antonio, a crescent of ivory sand between the rainforest and calm waters, perfect for swimming and snorkeling and nearby Playa Espadilla, a long beach lined with coconut palms and Indian almond trees. Enjoy the afternoon at the beach or exploring the quaint town of Manuel Antonio where you'll find a variety of excellent restaurants. Overnight in a one bedroom selected Villa at Tulemar Bungalows or similar room or property (no meals included at Tulemar). Spend this day at the beach and the national park. 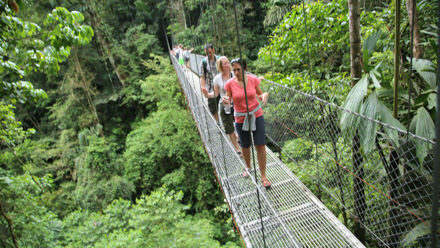 Enjoy a guided 2 ½ hour nature walk in Manuel Antonio National Park. 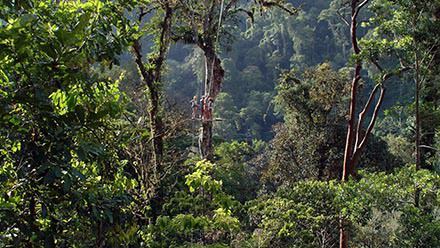 Watch sloths and numerous species of monkeys travel through the tree canopy. You might even spot one of the 1,000 remaining endangered Mono Titi (squirrel monkey), who live in only one location in the world, the Manuel Antonio National Park biological corridor. You may continue exploring the unspoiled, un-crowded, pristine beaches and winding forest trails after your guided educational adventure ends. Transfers to and from your hotel are included. Overnight in One Bedroom Selected Villa at Tulemar Bungalows or similar room or property (no meals included at Tulemar). Top off your adventure with one final day exploring the town of Manuel Antonio or just relaxing at the beach. You might consider signing up for an optional tour such as sailing, sea kayaking, or snorkeling. Or take advantage of one of the best areas in the world to learn how to surf with some optional surf lessons from a professional instructor. Take in one last sunset over the Pacific as you reminisce over the perfect week in paradise. Private ground transfer from Manuel Antonio hotel to San Jose International Airport (SJO) to connect with your international flight (no meals included). 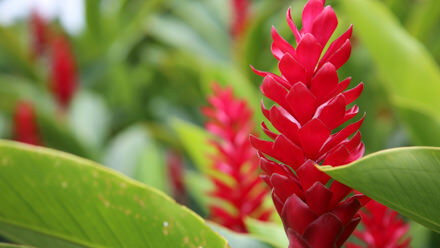 Note: All tours, transfer services and lodging are operated by handpicked, independent companies in Costa Rica. Book your flights in and out of San Jose, Costa Rica (SJO). A representative will be waiting for you as you exit security. From the airport, it's approximately 30 minutes to your hotel in the downtown area. Based on your arrival time, you may have some time to explore the local restaurants, museums or parks. We've tried to create a nice balance of activities and relaxation throughout your itinerary, but if you'd like be even more active, there are optional adventures you can add during your itinerary. Try sport fishing or surf lessons in Manuel Antonio or take an extra day at the Pacuare Lodge to visit the Cabecar Indian village on the Pacuare River. If you'd like to add another day or two in any location or even add a few days in Tortuguero, simply let us know and we'll work out the details for you. If you'd rather visit Costa Rica for 6 or 7 days, let us know. We can skip Arenal or Manuel Antonio or simply shorten your stay in either location. Visits to both locations are absolutely worth a trip, but we can make some suggestions based on your preferences. We don't want your vacation to feel rushed, but if you have limited time, we understand. You'll treasure any time you can spend in these magical places. On the final day of your vacation, you'll be transferred from Manuel Antonio back to the San Jose Airport, approximately 3 hours. 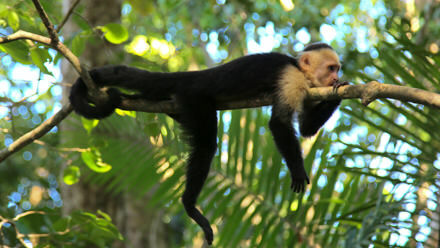 Schedule an afternoon departure if possible so you don't have to leave too early in the morning from Manuel Antonio. You'll want to arrive to the airport 2-3 hours in advance of your flight. To make sure you have enough time, you should plan to leave Manuel Antonio 6 hours prior to your flight.